Oregon. The emphasis on healthy lifestyles is evident from the many joggers and bicyclists (major downtown streets devote space for bicycles only). Along comes a trim 30ish woman in jogging gear, never missing a beat as she overtakes then passes the woman and pooch. I wonder if this younger woman will continue a fitness routine 30- 40-50 years from now, stay slender and value looking good. What Can We Do About Parents Who No Longer Make the Effort? Let’s face it. People change, not much. If people never cared about appearance or any semblance of a healthy lifestyle, short of a traumatic event or therapy from a good psychiatrist or psychologist, behavior is unlikely to change. Thus, we focus on three factors to help aging parents who cared once upon a time, before life got in the way. 1. Ruling out depression. Statistics tell us depression affects many elderly people. Diagnosing depression initially requires an appointment with an aging parent’s doctor then, if appropriate, referral to a psychologist or psychiatrist specializing in geriatrics. Click https://helpparentsagewell.com/2011/08/06/aging-parents-and-depression-2/ for an 8/2011 UCLA report on depression. 2. Understanding that a lessening of energy accompanies aging at some point. Sometimes there’s not enough energy (psychological and/or physical) to spark the effort required. Can we provide the spark? While there’s no guarantee, why not try? 3. Remembering or figuring out what aging parents still love–or they once loved doing. Then developing an improvement strategy involving exercise and appearance. Because my mother seemed uplifted by a new top and slacks that I brought her, it motivated her to–somewhat tentatively–agree to get some needed clothes. That motivated both of us to learn to gracefully get her walker–and her–in and out of the car. We could go together to a mall. The necessary walking provided needed exercise. We could eat a healthy, tasty lunch and perhaps look at clothing if energy permitted–or even cosmetics. Would she ultimately want to sit long enough for a complimentary make-up/makeover at the department store anchoring the mall? Food shopping was then added to Mother’s favorite outing list and that’s easy exercise–pushing the shopping cart involves walking as past posts have detailed. 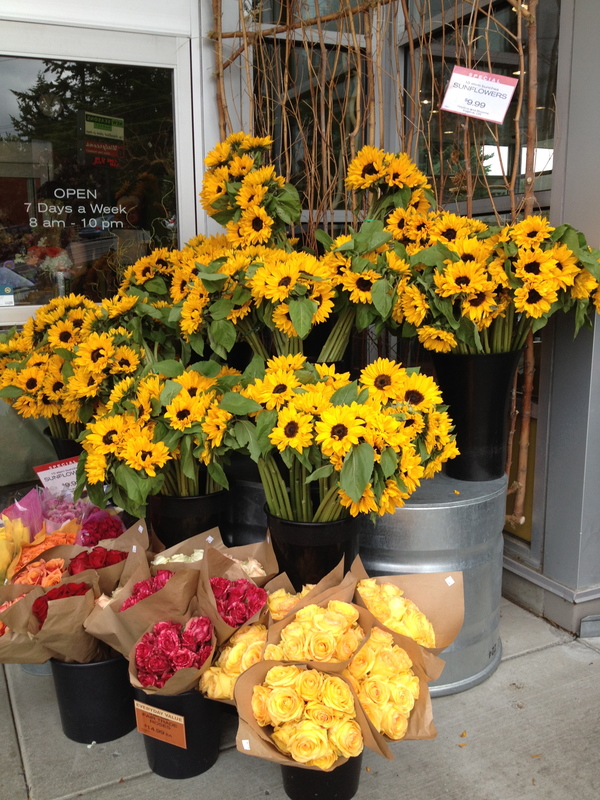 Summer in Oregon inspires beautiful floral displays flanking markets’ entrances (photo above). Buying flowers to take home–or even bringing an elderly person flowers–is good for the spirit. It also provides exercise and good busy work for one who is able to get out vases etc. and make a pretty arrangement. This entry was posted in Aging parents, Appearance, Fitness, walking benefits and tagged seniors and energy loss, seniors and exercise, seniors and inertia, seniors loss of interest. Bookmark the permalink.